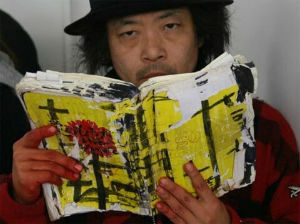 Sion Sono's English-Language Debut is PA! And it Stars Nic Cage! Japan's Sion Sono (Tokyo Tribe) has set his English Language debut feature with Prisoners of the Ghostland, a post-apocalyptic action thriller that will star Nicolas Cage. Untitled Entertainment’s Laura Rister, Eleven Arts’ Ko Mori, Reza Sixo Safai of Black Light District Entertainment and XYZ Films’ Nate Bolotin are producing. XYZ and Cage previously teamed on Mandy which is getting a summer theatrical release via RLJE Films. Recommended release: Why Don't You Play in Hell?